The Orgonite® devices are approved and endorsed by Karl Hans Welz, Orgonite® Co-inventor with Wilhelm Reich and owner of the Orgonite® trademark. I have his permission to use the name Orgonite®. 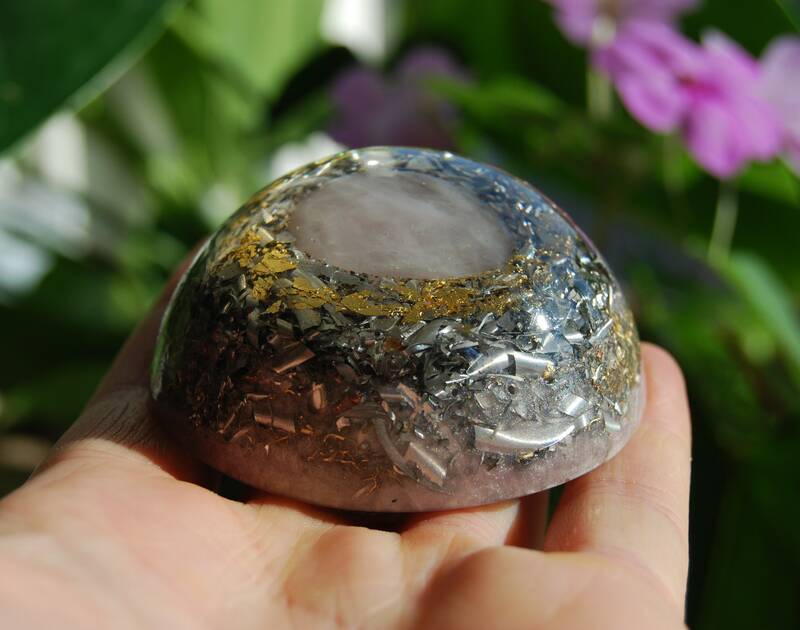 This powerful dome shaped orgone generator® consists of four natural terminated clear quartz crystals in the bottom positioned on all four wind directions for extended energy flow range to all sides. Recharges itself ! It consists of aluminium, brass, bronze and copper shavings and 24K leaf Gold. The main stone is a Rose Quartz which you can easily see in the top. It furthermore contains Rose Quartz (self love), one Rhodizite crystal (to amplify), black Tourmaline (to ground and protect), Pyrite (to enhance and deflect ELF (extremely low frequency) waves), Selenite (to charge and clean), Elite Shungite (to protect) and clear Quartz (for piezo electric effect) all within a durable polyester resin setting. 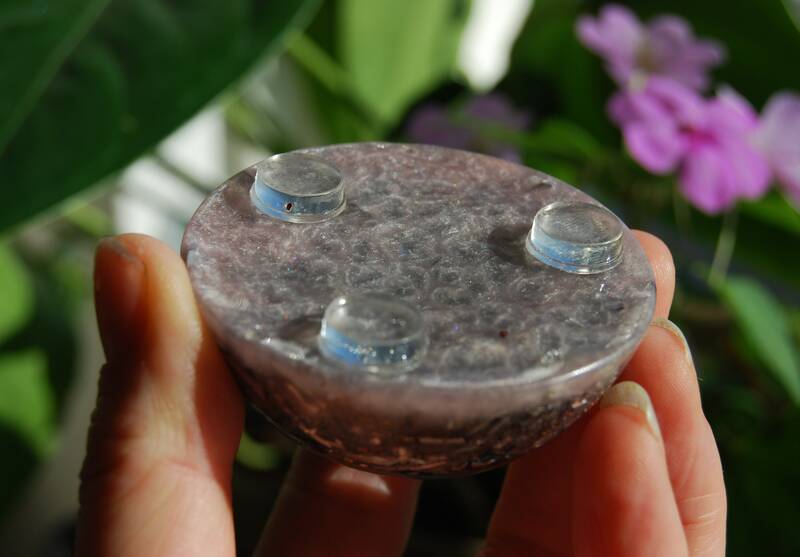 An Orgone generator® can be used to improve the energy practically everywhere. 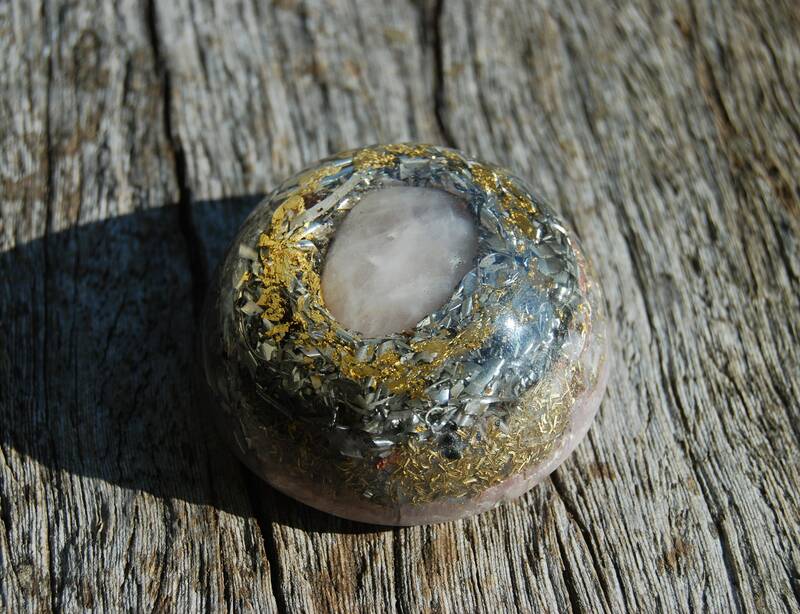 This Orgonite® dome is made with intuition, love 💖 and is created with loving intent to transform people’s lives for the better. Because it is a one of a kind hand-crafted one, it may have slight artistic imperfections. Rose quartz is often called the "Love Stone." It's energetic hallmark is that of unconditional love that opens the heart chakra. This makes rose quartz a stone for every type of love: self-love, family, platonic, romantic, and unconditional. As a variety of quartz, rose quartz has high energy, and this strong energy can enhance love in virtually any situation. This stone of unconditional love that opens the heart chakra to all forms of love: self-love, family love, platonic love, and romantic love. The high energy of quartz gives rose quartz the property of enhancing love in virtually any situation. Bringing love in to life and daily situations not only brings inner warmth, but it also lowers stress and soothes those around it. Rose quartz is a very happy and loving stone. Said to be around 2 billion years old, Shungite is a very powerful, ancient healing stone that detoxifies your body by absorbing and eliminating any negative or health hazardous energies. Elite Shungite, also called silver shungite, contains around 98% of organic carbon, making it the most beneficial and rarest forms of shungite. Elite Shungite is beneficial for EMF protection, purification of the body, general healing and well-being and much more. Shungite is a special pure carbon from the region of Carelia in Russia. This charcoal looking mineral has lately become known all over the world because of its amazing healing properties. It is the best grounding mineral of the planet. This amazing mineral is also highly effective to absorb radioactivity and EMF radiation. Its powder is used by the Russian army, to create EMF protective coatings and paints for buildings and aircraft. Today it is used worldwide by geobiologists to balance geopathy and dissipate emotional energy as well. The name comes from the Greek word meaning "a stone which strikes fire". 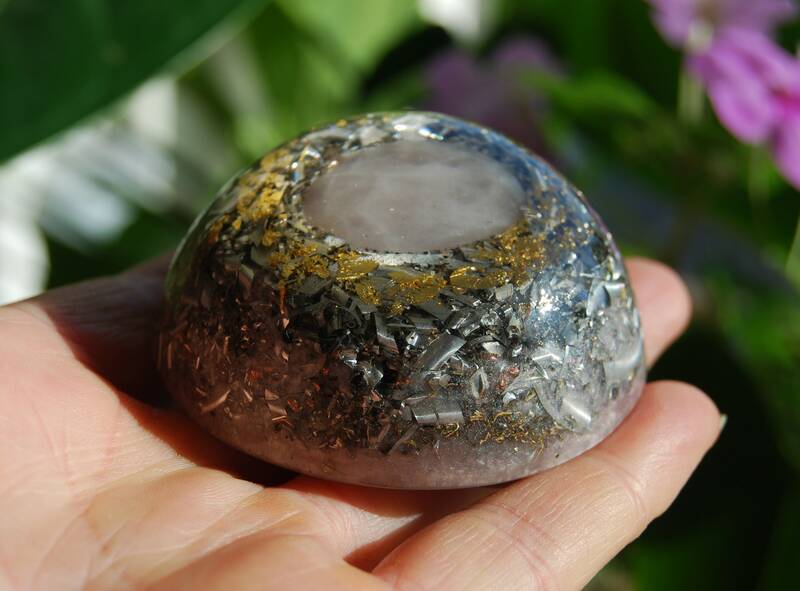 Iron Pyrite makes a wonderful energy shield, blocking out negativity from various sources. The primary feature of Rhodizite crystals is that they are amplifiers of energy, as they hold Solar power. You can hold a Rhodizite and another crystal together, and the second crystal's energy is vastly multiplied, without changing the inherent properties of that crystal. Rhodizite is a very high-vibrational stone with a cubic crystal system that comes in shades of yellow, cream, and clear. This is a very potent tool for your manifestation work. 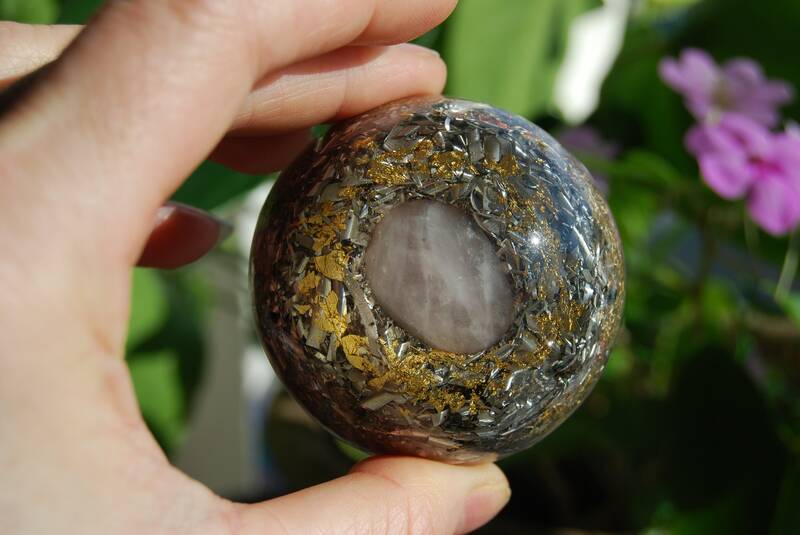 Rhodizite is a truly positive energy stone that never needs to be cleared or charged. 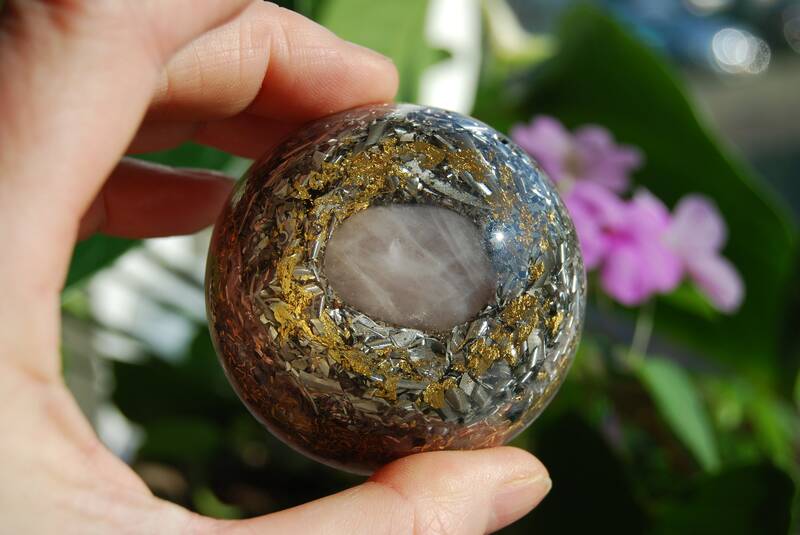 Rhodizite assists with astral travel by helping you get and process the information needed from the astral travel. It is also very helpful for meditation, making stilling the mind much easier. Madagascar Shamans are said to use rhodizite for "cloud busting" and initiating rain. These stones are also amazing at amplifying the energies of your other stones, especially in matters of healing. Energetically, rhodizite is very powerful for unlocking and clearing blockages, and activating all the chakras. Black Tourmaline is associated with the root or base chakra, and is excellent for grounding excess energy. It is a well known as a purifying stone that deflects and transforms negative energy, and thus is very protective. It can transform and remove negativity from an individual or an environment. It is often used as an aura cleanser, and can help one attain higher levels of awareness. Black Tourmaline has also been used to deflect EMF radiation energy from tvs, computer monitors and other EMF sources. A wonderful property of Selenite is that it has the power to cleanse and clear other crystals and negative energies so you never have to (re) charge your crystals. Selenite crystals are remarkably peaceful. They carry a very high vibration, and instill clarity of mind and a deep sense of inner peace. Quartz is a power stone. It has been called the "Universal Crystal" because of its many uses. It enhances energy by absorbing, storing, amplifying, balancing, focusing and transmitting. It channels universal energy. Quartz also enhances thoughts, as they are a form of energy. Because it directs and amplifies energy, it is extremely beneficial for manifesting, healing, meditation, protection, and channeling. It is also beneficial for storing and retrieving information of all types, as information is a form of energy pattern also. This makes them particularly good for programming to use for a particular purpose. Due to its ability to balance, quartz is excellent for harmonizing and balancing one's environment. Quartz is also good for energizing other crystals. Orgone is simply another word for what is also known as “Qi”, “Prana”, “Ether” and “Akasha”. It is a universal life-force energy which permeates all matter on earth. Orgone can exist in a positive, healthy form, as well as a stagnant, harmful form, often caused by modern technologies that emit EMF radiation. The side-effects of being surrounded by stagnant orgone energy include depression, anxiety, sleep problems, allergies, and other physical and mental health issues. Dr Wilhelm Reich, an Austrian psychiatrist, researched orgone energy in the earlier half of the 20th century. He found that organic materials attracted and held orgone energy, while non-organic metal materials attracted and rapidly repelled orgone energy. Today’s orgone devices are built on these two principles. As a mix of organic resin and inorganic metal shavings, they simultaneously attract and repel stagnant orgone energy, producing a “scrubbing” effect which re-charges the stagnant energy. 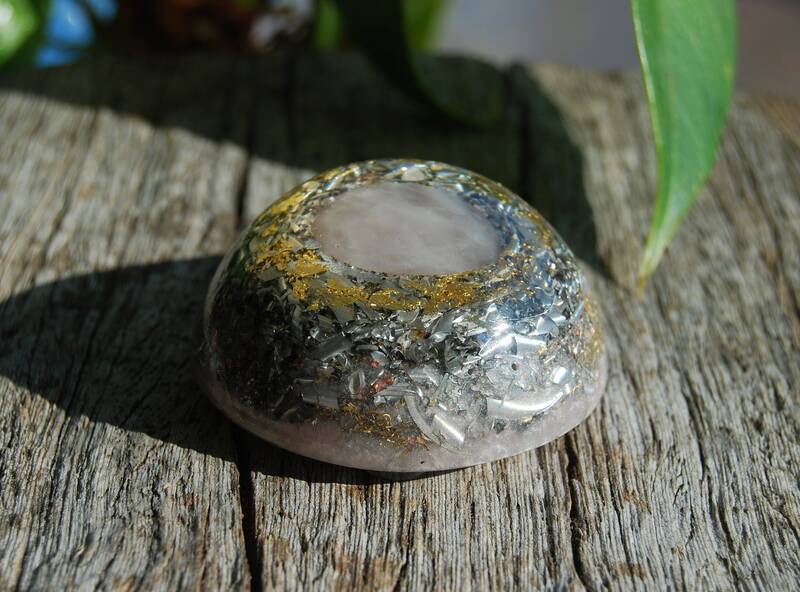 Orgone also includes an encased quartz crystal which has a piezoelectric effect (it produces a small electric charge when put under pressure). This adds to the energy-cleansing effect. 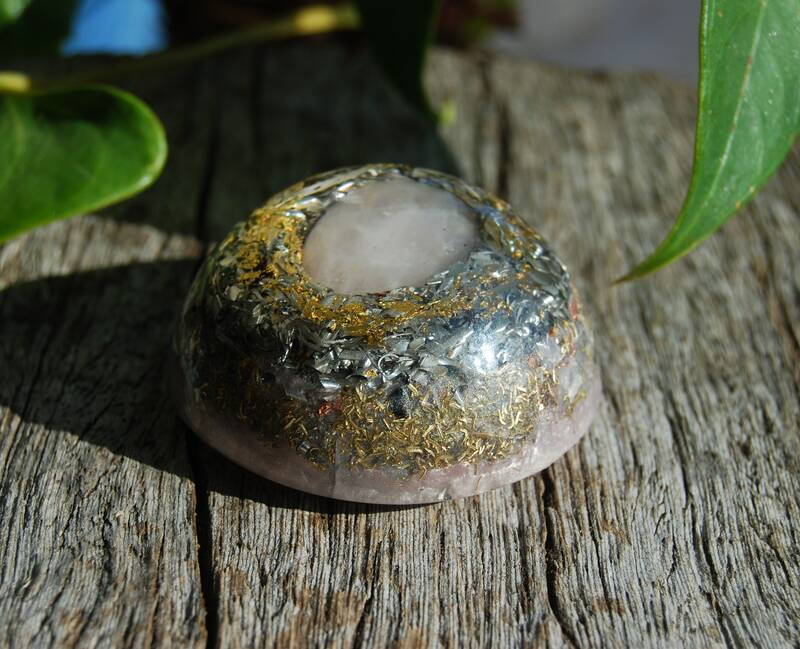 Orgonite® is a substance made of resin, metals and quartz that strengthens your body's energy field, helping to protect you from man-made EMF radiation and negative energy. These amazing metaphysical tools can help improve your life physically, emotionally and spiritually. Karl Hans Welz is the inventor of Orgonite® and Orgone Generator® and owns the registered Trademarks. I have his written permission to use the term Orgonite® and Orgone Generator®. Because it is a one of a kind hand-crafted one, it may have slight artistic imperfections. It has been hand sanded through 9 sets of fine polishing paper so it has a dome design and it is shiney and silky smooth. Will be shipped with Trackingnr. I use mostly recycled materials for my packaging. I happily accept PayPal, as well as major credit cards, Direct Checkout, bank transfers and Etsy giftcards. Please expect slower delivery times during the Holidays. I ship to the address that is listed with Etsy. If you wish for me to mail your package to another address, please email me. When possible, I try to ship items within 1-2 working days as they are purchased and paid. Some packages will be shipped with Postnl TNT and will have no trackingnr as to keep the costs low. An option to have a trackingnr is available while ordering. Some packages will be shipped via Deutsche Post / DHL. I will receive the trackinginfo from Deutsche Post / DHL usually one later and then I will let you know via email that the package has shipped including tracking information. I pack the item carefully, try to use no plastic and I also make use out of recycled package material. I do not include invoices with any package, thank you for your understanding! In some countries, buyers are subject to custom taxes and duties on items shipped from international locations. Duty/ import taxes are the responsibility of the customer. If you want, I can mark your item as a gift. I dont accept cancellations but feel free to contact me. I want you to be completely satisfied with your purchase. If you are not happy with your item, please let me know so we can work something out. If for some reason you wish to return an (unworn & clean) item, please let me know so I can approve the return. Please note that after items are inspected, I will refund the purchase price of the item, not the cost of shipping. Please note that actual colors can be a little bit different then the picture(s) shown. This is due to individual monitor settings. My art is handcrafted, please treat the piece with care. Do not shower or swim with it, just do not get it too wet. A little bit of rain will not affect the piece. Disclaimer: All of the Orgonite and Orgone Generators in this shop are radiation-free and not associated with nuclear, quantum energy, scalar, ions or radioactivity in anyway. These devices are experimental technology only and are not intended to treat, cure, or diagnose any disease whatsoever. The information on the stones that is provided is for informational reference purposes only and should not be used for the diagnosis or treatment of medical conditions. I have used all reasonable care in compiling the information but make no warranty as to its accuracy. Consult a doctor or other health care professional for diagnosis and treatment of medical conditions.